Both during and after the meeting, we received messages from participants telling of their experiences. Here are some of the contributions we received gathered by theme. Starting in September, an international team comprising several brother of Taizé, sisters of St. Andrew and 15 young volunteers from various countries have been visiting and meeting local people all over the region. In all 210 neighbourhood welcome points were set up, often by ecumenical cooperation, in Strasbourg itself, in the surrounding urban area, and in many villages on both the French and German sides of the Rhine. All the various churches of the region supported the meeting from its inception. 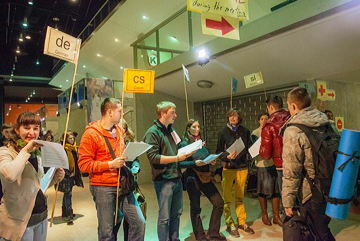 Thursday 26th December, 1500 volunteers arrived in Strasbourg, two days before the beginning of the meeting. 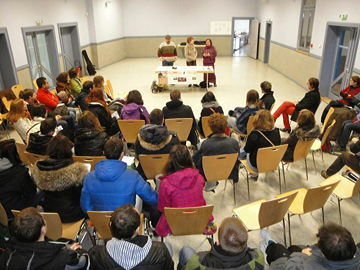 All through the morning, they received the explanations, their itineraries and their work for the two following days.They were sent to the parishes of the city and of the urban community, the only ones to welcome those young people who arrived early, before the young people were welcomed by the host families. Friday 27th, the welcome teams for all the languages are formed, the different choirs practising, the last decorations installed in the places of prayer, the teams charged with organising the circulation of people and the food distribution received all the important instructions... it is the eve of the big day. To note: before the crowds arrive, the prayers of the day must be transferred to a bigger place, an indication of the significant participation of the people of the region. Here is a selection of some reactions of volunteers. The magic of Taizé is that even tired from the trip, you want to participate in the prayers, meet new people and experience the solidarity among pilgrims. It is an experience I will remember for a long time! Tired, but with great hopes for this meeting. It will be very enriching for me to take part in the workshops, meet up with old friends and make new ones too! What a beautiful atmosphere! 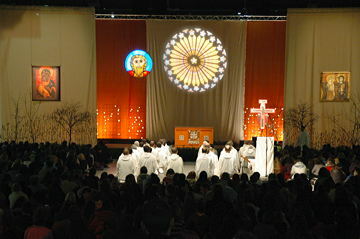 —you feel the spirit of Taizé in Strasbourg! I feel as if I am coming home to attend a family reunion. So many friendships! So many smiling, friendly faces, the Holy Spirit is present everywhere! As a Mexican, to be at a European meeting is already an experience that brings many new and unexpected things. I’ve been very impressed with how many volunteers have come earlier to help with the preparation of the meeting. Yesterday, during the evening prayer, Brother Alois said some words referring to this that I found really enlightening: these volunteers are not here just to organize the meeting but to give soul to it, and this soul doesn’t come from us but from the Holy Spirit, he said. The Spirit gives us the trust that we need. As a volunteer I had to manage the French reception on 28 December distribute the “road-maps”, the essential document each pilgrim needed. During the meeting, I helped as a steward during the food distribution. And, I also helped with the prayers and small-groups in the parish where I was staying. As a result, I did not have much free time but, as Brother Alois said, “when we give help, often we receive something ourselves.” And it is true that the many smiles and the joy of the pilgrims gave me a lot and encouraged me in what I was doing! Last September, I prepared the First East Asian Meeting in Korea and it was a very great experience for me. 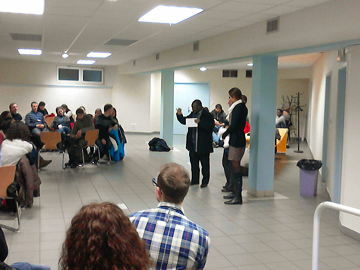 Compared to the European meeting, we were very few, only 300, but still it was very meaningful for us. So for me, as Asian, experiencing this meeting for the first time as a volunteer is impressive. All the people here are very motivated and good at organising. But without God, it couldn’t be like this, I think. I don’t know exactly how, but somehow I can realise the presence of God in many different ways. Reception on 28 December went well. Several hundred buses streamed into Strasbourg all morning. The reception points opened at 7am to give explanations in more than 20 languages. 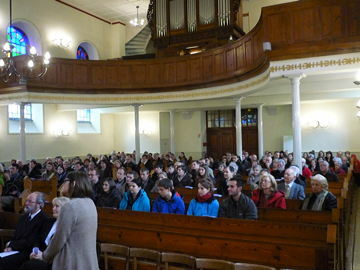 Then the participants were sent out to 210 host parishes throughout Strasbourg, its suburbs, and Alsace and Ortenau. It felt good to stay in the parish which welcomed us. What I really appreciated in the organisation on the arrival day was that there were two people waiting at the tram stop to showed us the way to the welcome place, and then some children walked with us to our host families. In Sélestat, at St George’s, several waves of pilgrims — Ukrainians, Polish, French, Hungarian and Portuguese arrived. They were greeted smoothly, thanks to the organising of some of us, and a great participation of many hosts and volunteers. What does the word “pilgrim” mean for you? With some young people this morning in the parish home we spoke about this. The pilgrim is always underway... It is the encounters with others from different backgrounds that help her grow... The mission of the Christian is to proclaim that Christ is risen. I came to Strasbourg in September to prepare for the meeting. This morning I visited the parishes of Neuhof. A priest told me what he had just experienced. He was supposed to celebrate morning mass with the priest of the neighbouring parish in the presence of young Europeans. As he has difficulty walking, they agreed that the other priest would come and fetch him by car. They arranged to meet in front of the Protestant church. All young people have been accommodated in families. Many people said to us before they left how much they were touched by the warmth of your welcome. That thousands of people opened their doors to young people they did not know, at a time when we are often afraid of strangers, underlines the communion of the church and deepens understanding between peoples. Approximately 8,000 people or families decided to open their doors to welcome young people. They did not know their names, or even their countries of origin in advance. Adrian, a young seminarian from Mexico who has lived in Strasbourg for three years, said: many Alsatians realised that they were ready to open their home to strangers, and that was often a completely new experience. Welcoming three young people in Lipsheim, I wanted to speak of my joy at sharing this time with them. A regular visitor to Taize, I promised myself that I would do something if the community came one day to Strasbourg for the pilgrimage of trust. With other engagements elsewhere, I could not help with the organisation, but I volunteered to welcome three young people. It was a surprise to get to know them, to discover their nationalities. I have been able to share with them in the morning prayers and I will be present for the prayer vigil for peace and the festival of nations. 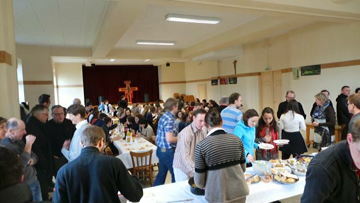 It was a joy to share in the meals at Wacken and the prayers at Saint Paul’s Church. 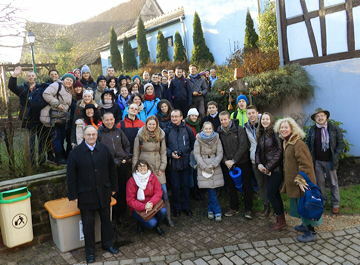 First of all I was truly moved by the hospitality of people of Alsace and Ortenau. Their serenity is a result of difficult history. My hosts told me the story of the many migrations faced during and after the war, and of the injustices suffered. Somehow because of that, in order to spread trust, they are open to share their everyday life, their houses and their love. It took my breath away when I saw the unity of the people who were preparing the meeting in my host parish. The Catholics and Protestants were working together with the same aim. This is an image of the Church I will keep in my heart. For the first time, the region welcoming us was both cross-border and bilingual. Almost a third of participants were welcomed in Germany, which involved a major organisational effort for the transport: almost 15000 young people travelled each day between the central location and the parishes where they were welcomed thanks to 210 shuttle buses, morning and evening. 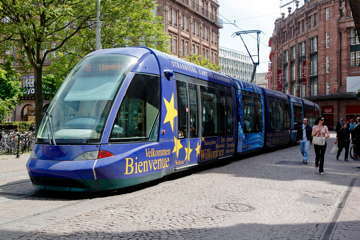 What’s more, 6 trams and a train to Colmar were specially put on for the meeting. A video shows the "ballet of the special buses" as they leave Wacken. 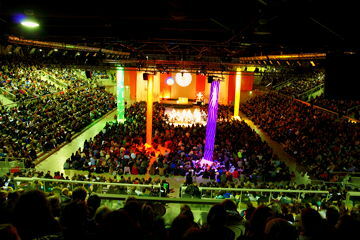 • 1,200 kg of instant lemon tea powder, with which around 20,000 litres of hot tea were served. 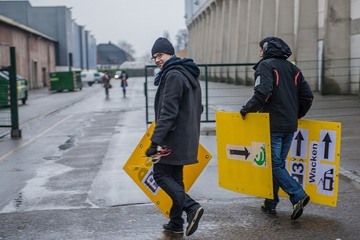 • a large number of bikes were hired from the City of Strasbourg for the preparation team. • for the first time, young people were invited to bring their own bag for the meals, avoiding the distribution of 20,000 plastic bags each day. • one parish gave all the participants a plsitc cup with the logo of the meeting as a "lasting souvenir". Each morning, there was prayer and small sharing groups in the parishes; at midday common prayer took place simultaneously in five places; in the afternoon, around twenty places in the city centre hosted different workshops; in the evening after the distribution of the meal, the common prayer took place in the same places as midday, with the young people going to a different place each day. One of the 48 afternoon workshops took place in the European Parliament, in the great chamber with representatives from different countries and 1550 young people. Several workshops dealt with problems faced by Europe, reflecting the presence of several international institutions in Strasbourg. Other workshops were very popular, such as those at the synagogue with the chief Rabbi, or at the mosque where there were almost 2000 young people. On the afternoon of 31st December, the participants gathered together by country for a reflection with a brother, allowing them to discuss, in their own language, the experiences lived during these days and to reflect on how to continue the pilgrimage back at home. Our visit to the European Parliament allowed us to speak with elected representatives and to understand more closely how the assembly works. It shone a light on the questions, the values, and the definition of a Europe seen from within.We, young people, ask ourselves many questions about our European identity, our future in this union, and the significant changes facing us in the future. The representatives we met pressed us to go further, to make ourselves heard by our votes, and to struggle ceaselessly for a more democratic world, as is happening in Ukraine, which was often used as an example. The world is in a crisis from which it can emerge more engaged on a route towards collective responsibility and the sharing of resources. As one representative said, "me, I am the past, you are the future, do it better than we have done." Apart from sightseeing, visiting common prayers and talking, my group also participated in two different workshops. We went to Temple Neuf, on a workshop that definitely had the most resounding name: “Stop, why are you hurrying? Heaven is within you.” Although we were not familiar with Meister Eckhart and his work, we had a nice time hearing about him and his influence, but most of all we enjoyed the beautiful music inside a wonderful interior. The following day, after the afternoon prayer in the Cathedral, we participated in a workshop held in the crypt of the Cathedral. Attracted by the “gigantic and delicate marvel” of the building, we wanted to explore its crypt, where we, once again enjoyed the music and poetry of the Alsace region. • The Christ of Wissembourg – ancient stained glass window from the church of St Peter and Paul in the city, representing the head of Christ. Note that in the Reformed Church of Saint Paul, the five stained glass windows in the chancel were the work of Brother Eric of Taize. I was born in 1951, so I have lived behind this Berlin Wall, which I believed was immovable. How joyful to be able to celebrate with all these young people in these mulit-lingual common prayers. What hope for our children and grand children - a world without war, a world of solidarity and mutual understanding ...A dream? No, it became a reality in the prayers which were full to bursting! What an ordinary Christian like myself can say and write after this experience, is first of all the certainty that this message of Jesus Christ has a beautiful future, carried by people of great openness and full of Christian hope. How can we not be amazed by this capacity for prayer, for keeping silence in moments of meditation and for listening to the word of God; by these four days of sharing experiences of lives of faith and of spending long moments in prayer and singing? I will willingly hold on to exchanges with several people whose languages were close to mine: realising that they are not fundamentally different to the young people we meet everyday; but that they have been able to find a sense for their lives in a way that means the presence of Jesus by their side is not just a formula. They wish to change the world in which they live by authentic encounters and sharing with others. On the evening of 31st December, at 11pm, the young people met together in their host churches for a vigil of prayer for peace until midnight. After the traditional new year’s greetings, each nationality was invited to present to the others something of their culture, a song, a dance, ... It was a powerful moment of encounter, and a unique way to welcome the new year. The last day of the meeting has already arrived. We slept a little later, after last night’s festival of nations. We had our last prayer in the parish, we have packed away our clothes and sleeping bags in our bags... but before leaving we still have the chance to get to know our host families a little bit better. These days the programme has been intense, with the prayers, the sharing groups and the workshops... we were away from our hosts from the morning until late in the evening. 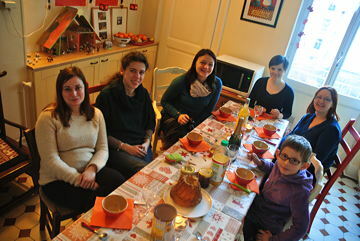 Now we are going to share a new year meal with our host families, and so speak with them and get to know them. And of course, we plan to finish with a souvenir photo of these people who were open to giving a place to sleep to total strangers! During the return journey, in the bus, we were still singing the songs of Taize. We were also able to share our experiences, to exchange stories about the families who had opened their doors to us, about the different host parishes who welcomed us. Thank you to everyone! They didn’t come from the East, but from Poland, Ukraine, Lithuania, Germany, Romania, Croatia, Belgium ... They brought neither gold, nor frankincense, nor myrrh; but bright eyes, an infectious enthusiasm, a thirst for encounter, a confident youthfulness and sometimes a hint of utopia. They didn’t seek Jesus in a stable, but in a meeting with ‘the other’, in the heart of what they shared, in the silence of prayer, in the melody of a refrain, in listening to a testimony. They too had followed the star; searching to discover how to build a world where people come together from different places, across boundaries, across cultural differences; a reconciled world, built on trust and a faith in the God of love and tenderness. Then they went away again, by the same road, leaving behind them, in our aging communities (they who thought they had come to meet only with young people), a little stardust sown by their youthfulness, a few open windows through which the spirit rushed in to remind us that, 2000 years on, the gospel can still make people get up and set off on a journey. Thank you to you, pilgrims of trust, thank you for this gift that you gave us, perhaps without even really realising it. We received many message of thanks following the live broadcasts of the prayers by different media outlets. We can still relive these prayers thanks to KTO, RCF and Domradio. The local churches put in place a "web studio" to allow young people to record a message; messages recorded by the programme "Paraboles" can also be seen online. Among the articles about the meeting, here are some to note, published on the websites of L’Alsace, La Vie, Mediapart, Rue 89, Mittelbadische Presse, Badische Zeitung, Badisches Tagblatt or on the website "Wiara". The television channel France 3 broadcast a series of interviews and reports from the meeting. Other channels also broadcast a report, such as TF1. There were several radio programmes about the meeting in Strasbourg, for example on France Bleu Alsace or Radio-Télévision Suisse. You can still send your ’echoes’ or a link to an interesting article to this address.